Matthew Rick has been planning Infinity Beverages for a long time. He said he first began building a business plan for a future winery in high school. At the time he was working as a server at a restaurant and would spend time talking to patrons about the various wines that were offered. A couple of years ago that plan became a reality, with Infinity Beverages opening in Banbury Place and promptly growing into a winery, distillery and tasting room surrounded by the warm brick of the old tire factory. The watermelon isn’t overpowering – it certainly isn’t a sweet, candy flavor – but comes in at the end with a nice, subtle hint. Infinity Beverages is a small operation that currently offers a range of wines, vodka and – new to the family – brandy. This new addition to the line-up is a watermelon brandy that comes in a clear, moonshine-style bottle (but I can assure you it’ll taste much better than something like that). The brandy is ‘unoaked’, making it clear, but it still has a classic brandy taste. The watermelon isn’t overpowering – it certainly isn’t a sweet, candy flavor – but comes in at the end with a nice, subtle hint. The brandy is part of a new experimental line that Infinity is starting, with small batches of various spirits that give Rick the ability to try things with little risk. He was experimenting with creating watermelon wine and had thought about whiskey, but settled on brandy. Rick said he’s always working on new ideas, often making small batches to have patrons at the tasting room sample and give feedback. Rick’s business philosophy is about branching out from the traditional and trying to create a unique product – and that’s apparent in every aspect of his business. Take catering: Instead of providing cases of wine to large events Infinity is working, Rick has begun using a new wine keg, which pours wine just like you’d have a beer. While it seems weird and almost wrong at first, Rick said its easier for everything from transportation to helping the bartender stay efficient. No idea is too much for Rick to try. And he’s always working on those new ideas. The next in his experimental series is a mulberry brandy that he’s been tweaking over the last few months and hopes to have out sometime in the future. But get it quick when it comes out – Rick is probably already thinking about his next concoction. 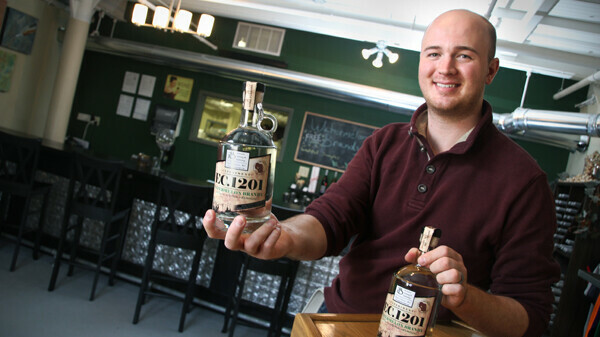 Find out more at InfinityBeverages.com or at their tasting room in Banbury Place, 930 Galloway St., Eau Claire.